Raj Process is reliable Manufacturer and supplier of wet scrubber in Pune, India. Wet scrubber is a form of pollution control technology. The term describes a variety of devices that remove pollutants from a furnace flue gas or from other gas streams. In a wet scrubber, the polluted gas stream is brought into contact with the scrubbing liquid, by spraying the liquid, by forcing it through a pool of liquid, or by some other contact method, so as to remove the pollutants. Any droplets that are in the scrubber inlet gas must be separated from the outlet gas stream by means of another device referred to as a mist eliminator or entrainment separator (these terms are interchangeable) Also, the resultant scrubbing liquid must be treated prior to any ultimate discharge or being reused in the plant. There are numerous configurations of scrubbers and scrubbing systems, all designed to provide good contact between the liquid and polluted gas stream. 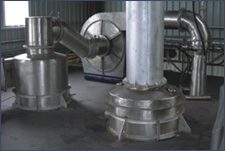 Scrubbers reduce the temperature and volume of the unsaturated exhaust stream. Therefore, vessel sizes, including fans and ducts downstream, are smaller than those of other control devices. Smaller sizes result in lower capital costs and more flexibility in site location of the scrubber. Once particulate matter is collected, it cannot escape from hoppers or during transport. No temperature limits for operation. No condensation problems can occur as in baghouses. Various dry dusts are flammable. Using water eliminates the possibility of explosions. Pollution control in process industries. Are attached as Pollution control equipment in drying systems.